This past Friday, we had a really impressive ceremony to mark the completion a tunnel stretch being excavated by one of our three tunnel boring machines (TBMs). I've got a cool (short) video for you to watch! First, some background. This tunnel, a part of the Pahang Selangor Raw Water Transfer project, will deliver water from the Malaysian state of Pahang (which has lots and lots of rivers and water) over the mountains to the neighboring state of Selangor, where Kuala Lumpur and other population centers are located. It is a classic "interbasin" water transfer project. You engineers, earth scientists and other techies reading this can download this past issue (PDF file) of the magazine of the Board of Engineers Malaysia and read about the project starting on Page 42 onward. The construction is funded 75% by Japanese aid, and 25% from Malaysian government funds. The tunnel is 44.6 km long. This makes it the longest tunnel in Southeast Asia, 11th longest in the world, and with the 8th highest overburden (height of ground above tunnel --- 1,246 meters in this case) in the world. The TBMs are gouging a 5.2 meter diameter tunnel through some pretty hard granitic formations. Oh, by the way, don't let anybody tell you US companies can't compete overseas! The three TBMs in use here were designed and built to this project's specs by The Robbins Company of Solon, OH. Their PR hacks were here in droves to record the breakthrough (while the poor Robbins tunnel guys were slaving away at their TBM). Robbins is reckoned to be best of their class for the "hard-rock" TBMs, while their German competitors are reckoned to be better for "soft-rock (shield)" TBMs. Of the 44.6 km of the tunnel, 34.5 km are being excavated by three TBMs. The rest (the red parts on the figure) were excavated by conventional drilling-and-blasting or by cut-and-cover. 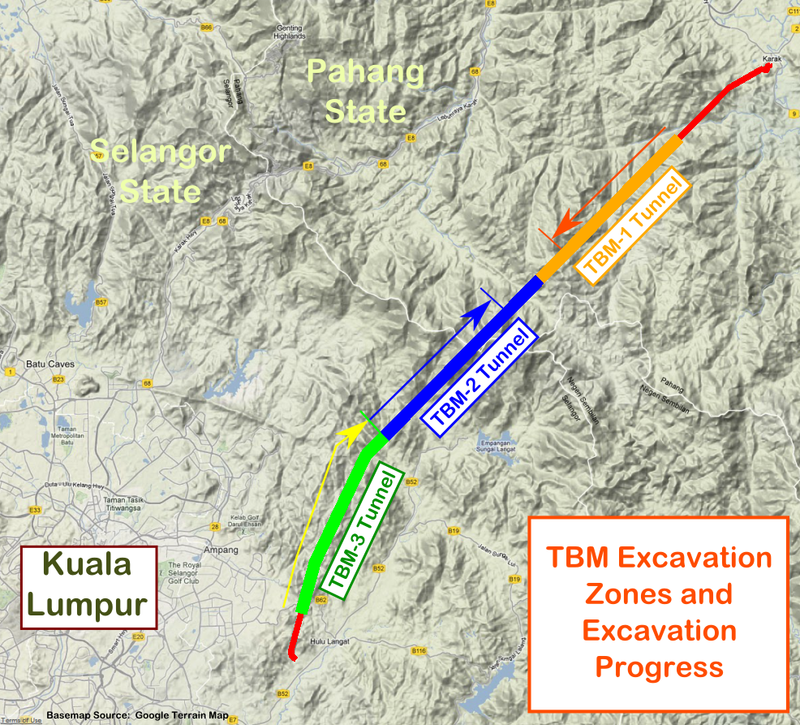 As you can see from the figure above, TBM-1 is excavating downstream from the Pahang side, while TBMs 2 and 3 are excavating upstream from Selangor towards Pahang. It was TBM-3 that just completed its 28-month, 11.6 km run. The other two have several more months to go. Waving Malaysian flags, the TBM crew in red coveralls, the Malaysian geologist, Japanese and Indonesian tunnel engineers, and that Robbins guy in blue all emerged from a tiny maintenance hole in the cutterhead. A Japanese kiyome site purification ceremony followed, with Japanese tunnel engineers from the two Japanese contractors in the joint venture "anointing" the exposed TBM-3 cutter head with salt, rice grains, and sake rice wine. Then the VIPs started speechifying --- we'll skip that part. Anyway, on behalf of Pat and myself, I'd like to say "hi" to our readers, and we look forward to seeing many of you in a couple of months' time back in Michigan! Please make sure the snow is gone by the time we get back! Cheers! this is a very intresting writing as I am a gtechhnical person myself. A horizontal boring machine is a time-saver machine used to bore holes in highly rigid construction. Thanks for sharing this useful post.